The rapidly evolving digital marketing space has seen birth and death of many tactical strategies. Some strategies on the other hand just evolve with time, becoming an upgraded armour for the marketer to unleash when situation demands. It doesn’t matter whether you are offering is a product or a service. For your offering to stay relevant the critical stakeholder is always your customer. Among the ones you count as customers the ones who emerge as brand advocates are a critical resource for your business success. That audience to me is true influencers, the #Superfans as I would like to call them. I call them #Superfans not because they express undying love for your brand and its products. They are #Superfans because they help you stay real, help you understand what your target audience wants and help you build products which sell and sell big. Influencer marketing is not a new concept. It’s probably in recent time the most abused strategy. Well I am not complaining here, the mercenaries who call themselves influencers today have helped brands amplify their reach. This is even more relevant in the current times where social media is a key brand communication channel. But they are not the #Superfans the brands truly desire. There is also the challenge of being able to identify the true brand champions in the social media clutter. All brands today have heavily invested in various social media channels to build community of prospects and consumers alike. The larger question is how worthy are these investments. The cost of acquisition of large base of users to build a community on social media channels is certainly not cheap. It’s certainly not worth the efforts if you fail to convert large user base of likes & followers to the benefit of the brand. Brands act of acquiring say ten million likes on Facebook or a million followers on twitter are just a vanity metric if you are unable to build an army of #Superfans. I don’t believe all the likes and follower count can be weighed as brand advocates. It’s a long cycle to nurture a prospect to brand loyalist or a brand advocate. It’s certainly not possible to create that journey on social media sites alone. What’s missing on the social media platform is the undivided attention of the so called fan and ability of the brand to create exclusive communication for the true influencers, the #Superfans. I did a broad study to gather some data and put the missing pieces together to discover the framework some of the brands have implemented. I closely examined activities in the online space by some of the Chinese smartphone brands which have flooded Indian market and it seems to reveal a pattern. The evaluation of all four brands i.e. 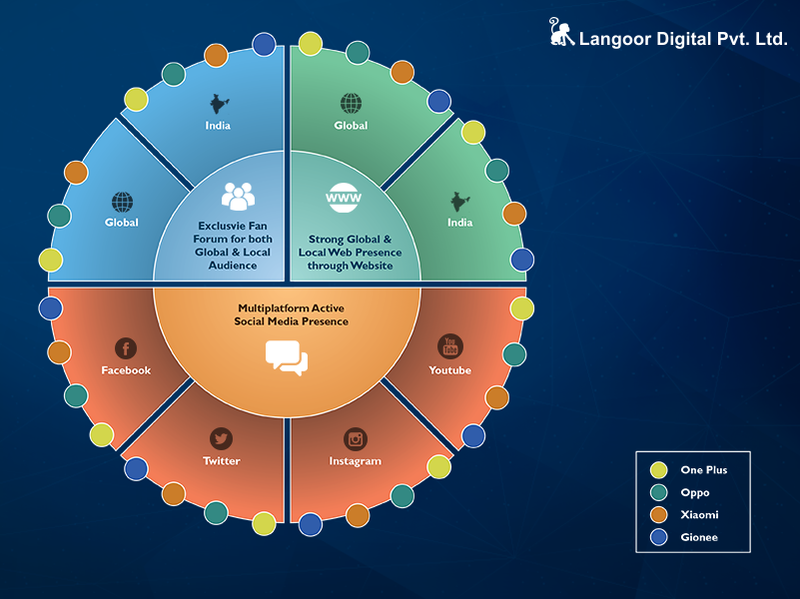 OnePlus, Oppo, Xiaomi and Gionee clearly indicates that establishing 360 degree online presence approach is the primary activity.This has to be followed up with strong content and conversational tone of content seeding on these platforms. 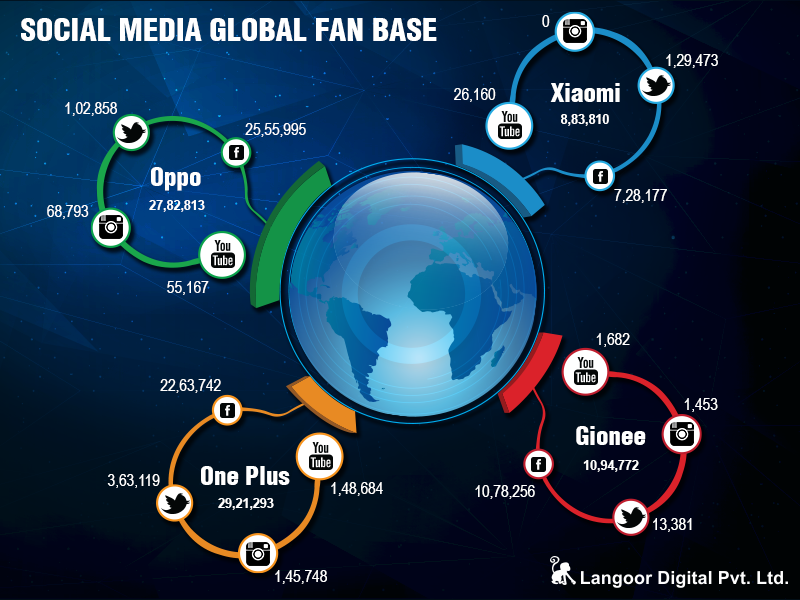 Smartphone brands OnePlus and Oppo are having the leading share of fan base when you evaluate them on the basis of their Global brand pages. Facebook followed by Twitter is the most popular and stronger platforms for almost all four brands considered. 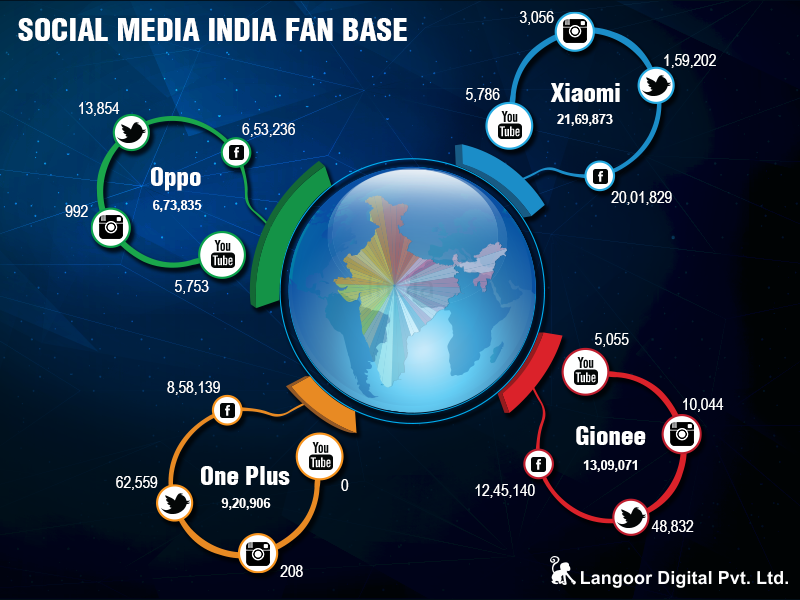 Contradictory to the global social media page analysis smartphone brand Xiaomi has the leading share of fan base with regards to India as a market. Interestingly Gionee has a much stronger presence on Instagram. Facebook and Twitter are still the most popular and stronger platforms for almost all four brands considered even in context of India as focus market. 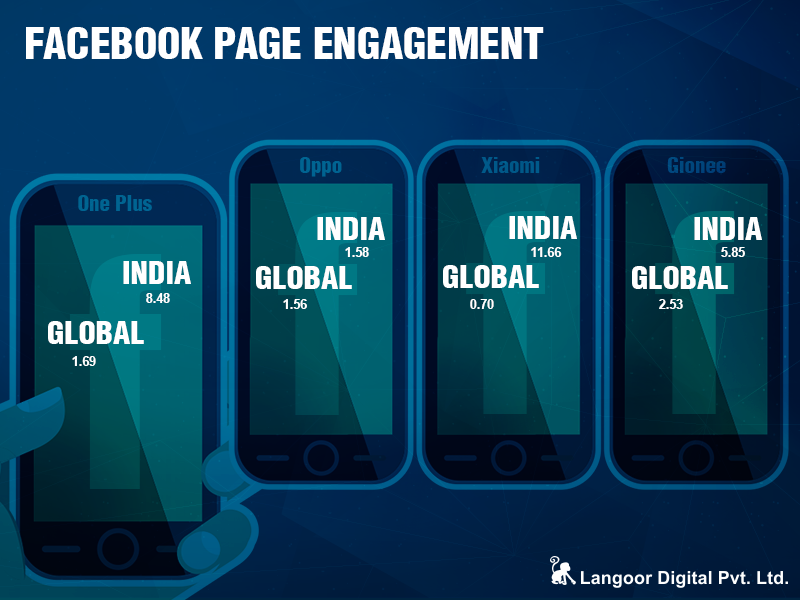 When we analyze the engagement rate of all four brands on their individual Facebook brand pages it’s apparent that the key focus market for them is definitely India. The keenness with which these brands are nurturing conversations with high response rate is also an indicator that Facebook is primary #Superfan nurturing platform. 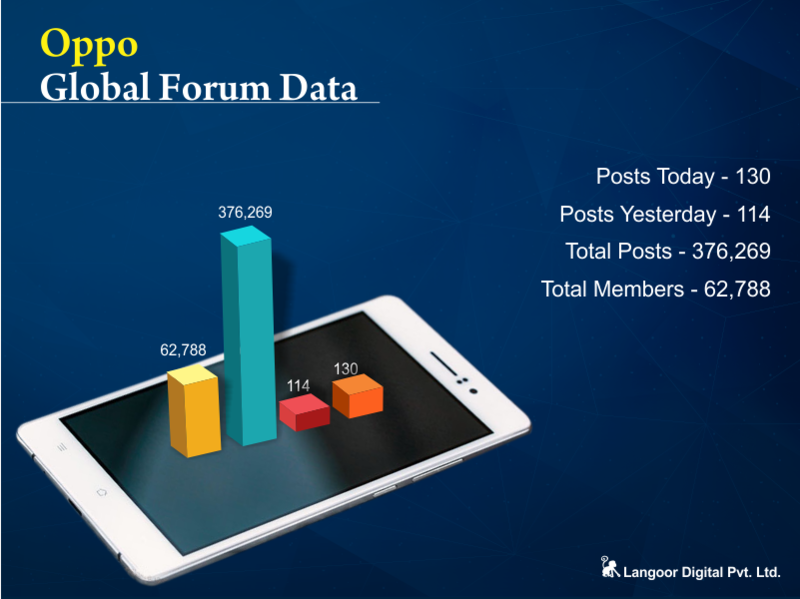 In the above data visualization the focus was to dissect and analyze the activities and responses of brand influencers on the brand forums. These are exclusive fan communities created by the brand wherein the buckets of conversational hooks are many. What’s interesting is all though the overall number of fans is lesser than social media channels the active base and engagement of users with the brands is higher and more personal. 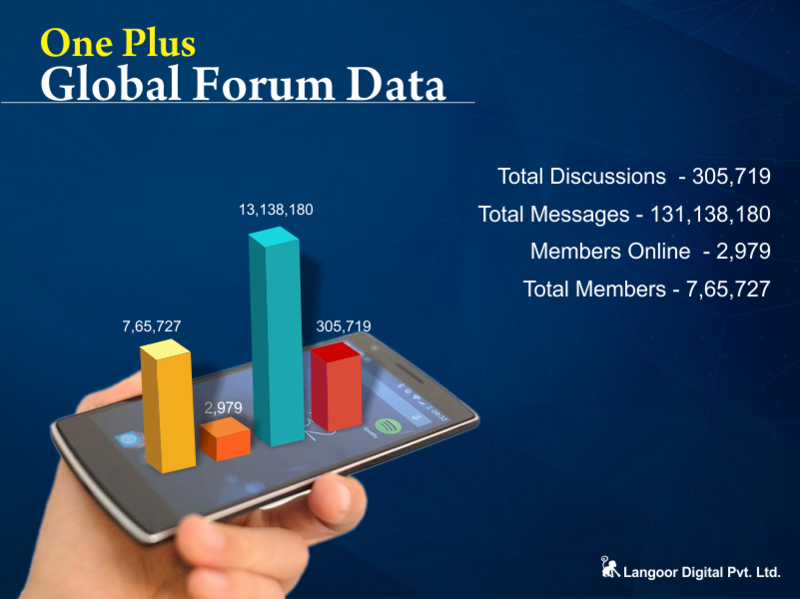 In the above data visualization the focus was to analyze the larger buckets of conversation categories and activities the brands considered for the study use on their forums. The idea as it appears is for the brands is to strengthen their connect with the core audience and superfans. Incentivise and provide exclusive access to information about their products. This also results in great insights for product improvement for these brands. *Note: Data for above analysis was collated as on 12.11.2015 through social media pages of respective brands and their web forums. Social media channels are being used as the primary platform to garner mass attention of broad target audience for markets in focus. Social media platforms act as the hunting and fostering ground to amass broader set of prospects and fans. Amongst social media channels Facebook and Twitter are of primary focus to acquire fans and engage with target audience. Creation of exclusive brand engagement platforms such as forums or communities either as a part of brand websites or independent of websites. Content curation and seeding on social media channels to promote migration of fans from social media pages to the exclusive fan forums. Articulating fans who are a part of the exclusive brand forums as #Superfans and rewarding them with exclusive pre-launch product trials, exclusive contests and other acts of gratitude only to members who are a part of the forum. Streamlined customized content strategy for fan forums and well moderated multiple discussion topics and sections on the forum webpage. 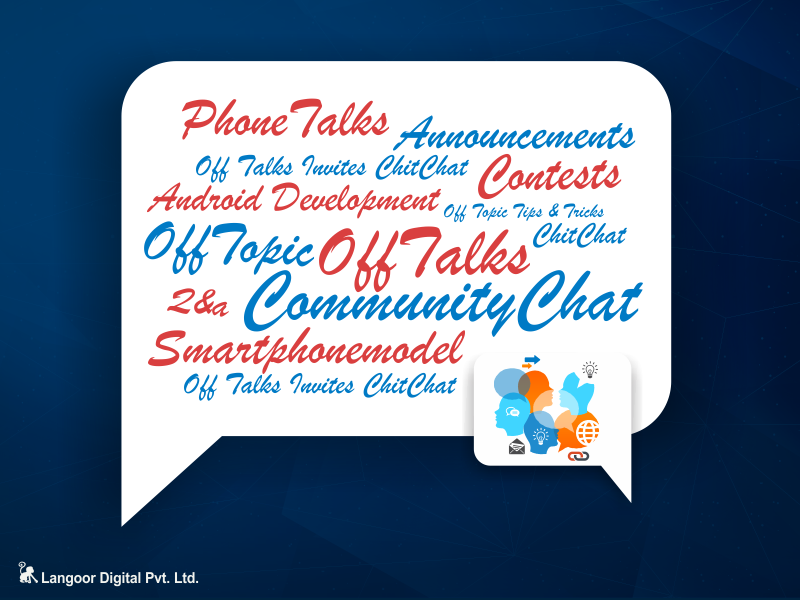 Recognizing and rewarding the most regular and active members on the forum as the true #Superfans and promoting them brand champions. 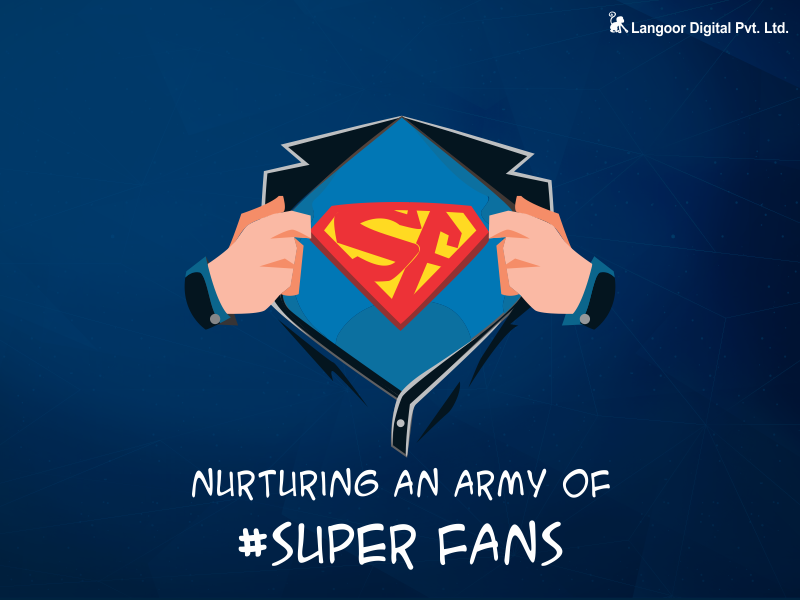 Thus creating an army of #Superfans who are the true influencers for the brands both online and offline.